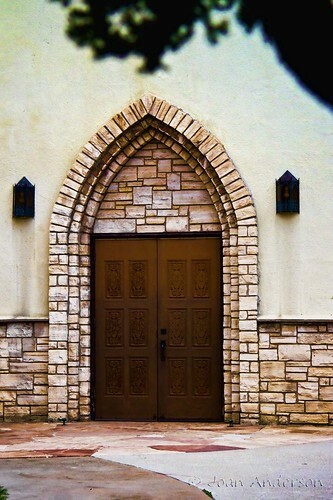 The entry to the Methodist church appeals to me, but the location has always puzzled me. It is in this set back area that you just don't see unless you go looking for it. 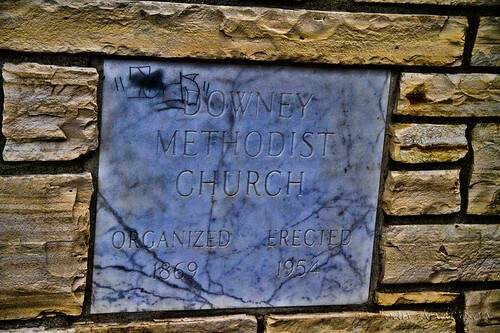 I was surprised to read on the marble marker that the church has been in existence in Downey for over 140 years (although, apparently not in its current location). According to the history of Downey, College Settlement began in the 1860's when John Ardis purchased a parcel of land in the southwest corner of Rancho Santa Gertrudes. Ardis opened a private school and in 1869, with the Methodist Church, established the Los Nietos Collegiate Institute. This school-church centered community attracted settlers who had traveled west hoping to settle and raise families. Nice to see (according to their website) the church still has the same grassroots mindset: a place to connect...to God to people and to faith. Did Banksy leave his mark in Downey?